Sergey Bratus, Ricky Melgares, Rebecca Shapiro, and Ryan Speers. The following technique is a trick that some very good neighbors and I present in Packets in Packets: Orson Welles' In-Band Signaling Attacks for Modern Radios (pdf) at Usenix WOOT 2011. As the title suggests, Orson Welles authored and implemented the attack in 1938 as a form of social engineering, but our version acts to remotely inject raw frames into wireless networks by abuse of the PHY layer. As that paper is limited to a formal, academic style, I'd like to take the opportunity to describe the technique here in my people's native language, which has none of that formal mumbo-jumbo and high-faluttin' wordsmithin'. This being just a teaser, please read the paper for full technical details. The idea is this: Layer 1 radio protocols are vulnerable injections similar to those that plague naively implemented SQL websites. You can place one packet inside of another packet and have the inner packet drop out to become a frame of its own. We call the technique Packet-in-Packet, or PIP for short. In the specific case of IEEE 802.15.4, which underlies ZigBee, the Preamble consists of the 0 symbol repeated eight times, or 00000000. The Sync is A7. After that comes the Body, which begins with a byte for the length, a few bytes for flags, the addresses, and some sort of data. Suppose that an attacker, Mallory, controls some of that data, in the same way that she might control an HTTP GET parameter. To cause a PIP injection of a Layer 2 packet, she need only prepend that packet with 00000000A7 then retransmit a large--but not unmanageably large--number of times. I'm not joking, and I'm not exaggerating. It actually works like that. Below is a photograph of the first packet capture in which we had this technique working. The upper packet capture shows those packets addressed to any address, while the lower capture only sniffs broadcast (0xFFFF) messages. The highlighted region is a PIP injection, a broadcast packet that the transmitter intended to only be data within the payload of an outer packet. 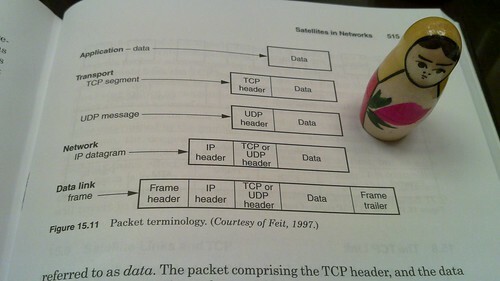 When Alice transmits a packet containing Mallory's PIP to Bob, Bob's interpretation can go one of three ways, two of which are depicted in the diagram below. 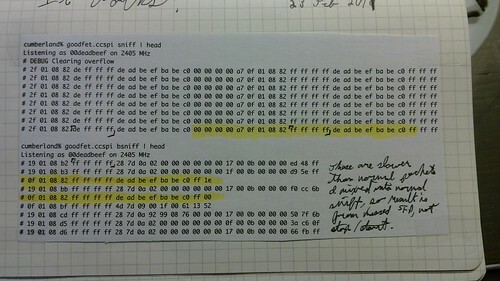 In the first case, as shown in the left column, Bob receives every symbol correctly and interprets the packet as Alice would like him to, with Mallory's payload sitting harmlessly in the Body. In the second case, which is not depicted, a symbol error within the Body causes the packet's checksum to fail, and Mallory's packet is dropped along with the rest of Alice's. The third interpretation, shown above in the right column, is the interesting one. If a symbol error occurs before the Body, within the Preamble or the Sync, then there's no checksum to cause the packet to be dropped. Instead, the receiver does not know that it is within a packet, and Mallory's PIP is mistaken as a frame of its own. Mallory's Preamble and Sync will mark the start of the frame, and Mallory's Body will be returned to the receiver. In this way, Mallory can remotely inject radio frames from anywhere on the network to which she can send her payload. That is, this is a PHY-Layer radio vulnerability that requires no physical access to the radio environment. Read the WOOT paper for complications that arise when applying this to IEEE 802.11, as well as the conditions under which a PIP injection can succeed on every attempt. In 1938, Orson Welles implemented a similar exploit as a form of social engineering in order to cause panic with his War of the Worlds (mp3, transcript) performance. ANNOUNCER: The Columbia Broadcasting System and its affiliated stations present Orson Welles and the Mercury Theatre on the Air in The War of the Worlds by H. G. Wells. ANNOUNCER: Ladies and gentlemen: the director of the Mercury Theatre and star of these broadcasts, Orson Welles . . . It was near the end of October. Business was better. The war scare was over. More men were back at work. Sales were picking up. On this particular evening, October 30, the Crosley service estimated that thirty-two million people were listening in on radios. That introduction is two minutes and twenty seconds long, and it was scheduled to begin while a popular show on another station was still in progress. Many of the listeners tuned in late, causing them to miss the Sync and not know which show they were listening to, just as in a PIP injection! What follows is thirty-eight minutes of a first act, without a single word out of character or a single commercial message from a sponsor. The play begins in the middle of a weather report, followed by repeated false station and show announcements, a few of which follow. We now take you to the Meridian Room in the Hotel Park Plaza in downtown New York, where you will be entertained by the music of Ramón Raquello and his orchestra. From the Meridian Room in the Park Plaza in New York City, we bring you the music of Ramón Raquello and his orchestra. We are now ready to take you to the Princeton Observatory at Princeton where Carl Phillips, or commentator, will interview Professor Richard Pierson, famous astronomer. Good evening, ladies and gentlemen. This is Carl Phillips, speaking to you from the observatory at Princeton. Just a moment, ladies and gentlemen, someone has just handed Professor Pierson a message. While he reads it, let me remind you that we are speaking to you from the observatory in Princeton, New Jersey, where we are interviewing the world- famous astronomer, Professor Pierson. By repeatedly lying to the listeners about the station and the program, Welles was able to convince them that they were listening to legitimate news broadcasts of an alien invasion. Ensuring that the listener missed the starting broadcast announcement breaks the encapsulation that was intended to prevent such confusion, just as a PIP injection relies upon the start of frame to be missed in order to break OSI model encapsulation. This class of vulnerability is a really, really big deal. An attacker can use it to inject raw frames into any wireless network that lacks cryptography, such as a satellite link or an open wifi hotspot. Not only that, but because the injection is remote, the attacker needs no radio to perform the injection! Not only that, but this vulnerability has sat unexploited in nearly every unencrypted digital radio protocol that allows for variable frame length since digital radio began! So why did no one notice before 2011? Packet in Packet injection works because when Bob forwards a wrapped string to Alice over the air, he is trusting Mallory to control the radio symbols that are broadcast for that amount of time. The potential for abusing that trust wasn't considered, despite communications experts knowing full well that sometimes a false Sync was detected or a true Sync missed. This is because a symbol error in the Sync field causes the packet to be implicitly dropped, with the same behavioral effect that would be had if the error were later in the packet and it were explicitly dropped. Except when faced with a weaponized PIP injection, nothing seems strange or amiss. Sync errors were just a nuisance to communications engineers, as we security guys were staying a few layers higher, allowing those layers of abstraction to become boundaries of competence. That same trust is given in wired networks and busses, with the lesser probability of missing a Sync being the only defense against PIP injection. Just as PIP has shown that unencrypted wireless networks are vulnerable even when the attacker is not physically present, I expect wired networks to be found vulnerable as soon as an appropriate source of packet errors is identified. Packet collisions provide this in unswitched Ethernet networks, and noisy or especially long links might provide it for more modern wired networks. If I've not yet convinced you that this attack is worth studying, I probably won't be able to. For the rest of you, please print and read the paper and extend this research yourself. There's a hell of a lot left to be done at the PHY layer, and it might as well be you who does it. Excellent work and as always a great presentation, you really do amazing HW things. One small, small nitpick; In the third para it reads "The idea is this: Layer 1 radio protocols are vulnerable injections". I guess the word "to" is missing. One thing the paper does not address/suggest is how to solve the situation. How should we add injection filtering, authentication and integrity protection on L1? Esp without seriously complicating the protocols and open up for other attacks. Fascinating. Would data-whitening affect this attack? Interesting post, and a really clever name for it! ZigBee is clearly vulnerable to this attack, but I'd be shocked if the problem is widespread--I worked on this sort of system many years ago, and it was common practice to include a "scrambler" in the design--the final step before handing the bit stream off to the transmitter was to "scramble" it by looking at the bit stream and adjusting it, both so it had enough 0-1 and 1-0 transitions to insure timing recovery on the far end... and to make sure you never transmitted anything that looked like a framing signal. The scrambler wasn't cryptographic--it was simple, deterministic, and easily reversible. Using your SQL injection analogy, it was the equivalent of "escaping" troublesome sequences in the bit stream. You are right that scramblers can be troublesome, but at least in 802.11B, they weren't too much trouble. When injecting at the same data rate, the scrambler is self-synchronizing and self-correcting. 802.11B specifies a preamble and Sync in the pre-scrambled state, and *any* scrambled version of them is acceptable, so the attacker doesn't need to know the scrambler state and no scrambler state will hurt the odds of injection. When injecting a 1Mbps packet from within the body of a 2Mbps packet, which is more common, the scrambler does become a pain in the neck. Luckily, its state is only 7 bits, so at worst it only reduces the odds of injection 128 times. I've posted scrambler source code at https://github.com/travisgoodspeed/80211scrambler for Verilog. Did you know that you can create short urls with Shortest and get money from every click on your shortened links. It seems to be obvious the possibilities that the PiP attack creates, but I'm struggling to come up with any truly threatening or useful scenarios. Specifically in 802.3 (Ethernet) which was suggested for future work in the paper because of the "staggering implications." Would anyone be so kind as to elucidate the possibilities for me?